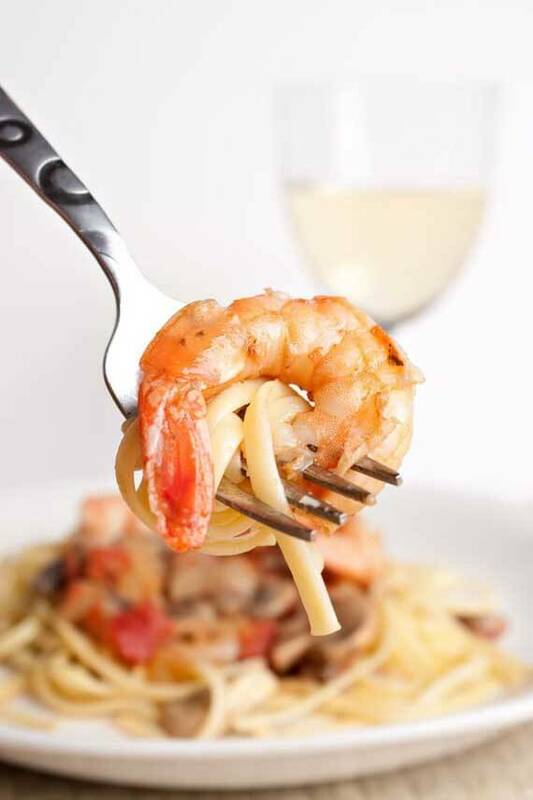 Your favorite pasta dish gets a deliciously healthy makeover with this clean eating shrimp scampi recipe! On a recent trip to the grocery store, I read Women’s Health Rx Magazine while I was standing in the checkout line. I was pleased to read that a new study done here in the states shows that eating shrimp and other fish associated with high cholesterol has absolutely no effect on heart health. Apparently, you can eat all the shrimp you want, and it will not have any impact on your heart! I’m not sure about this one single study or what conditions the study was done under, but I will say that I do include shrimp in my clean eating menu plan, and I’ve never thought twice about it. So it was nice to read something that backed up my feelings on shrimp. This recipe was adapted from one of the South Beach Diet cookbooks. Embarrassingly enough, I can’t remember which one. But I was definitely inspired, and the outcome was absolutely delicious. I’ve been making it ever since! If you love scampi, you've got to give this healthy version a try. Simply wonderful!! Place frozen shrimp into a non-stick skillet with oil. Cook shrimp until they are mostly cooked and there is a nice bit of liquid in the pan (this will become your sauce). Add everything else except the pasta. When the shrimp is done and the flavors of your sauce have melded nicely, remove from heat. Serve over pasta with a little parmesan, salt and pepper for taste. You have just been given the “One Delicious Blog” Award for your blogging adventures in food. Keep up the tasty work! Thanks Aimee! I’m so flattered! This site is great! you give a wealth of information for the beginner and some tasty recipes too! Thanks! Thanks so much Signe! Enjoy! I just made the shrimp scampi andit was amazing! If eating clean is so tasty i might be able to stick with this. Love this site! Tina – That’s my whole goal with this site is to show people that you can eat tasty food AND be healthy! So happy you enjoyed it! Richelle – Fantastic! I’m impressed that your kids ate it. My little guy doesn’t care for shrimp. Thanks for trying my recipe! hi I enjoyed this recipe but I think I messed it up. The lemon seemed to be over powering falvor in the dish. Is there a way to fix this? Ruth – Hmmm. That definitely should not be the case. I’d say use half the lemon next time and then add more to taste if you need it. Hi! I love shrimp scampi, but haven’t been making it b/c my recipe calls for lots of butter and olive oil. 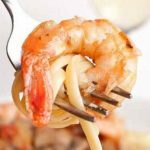 Since this recipe only has 1/2 tsp of olive oil, does it make a sauce because the shrimp are frozen? Is there anyway to use fresh shrimp and still get a sauce without all the butter/oil I am used to? And parmesan! Just a tad? Jaime – The water from the frozen shrimp really helps with the sauce. If you must use raw shrimp, you may have to add a bit of water to get any sauce. Oh yummy! I have to try this! I love scampi but stopped eating it since i’ve changed my eating habits. I’m going to put this on my food list to make! Michelle – Great! Let me know how it turns out! Carola – Glad you enjoyed it! Mhoffman – I don’t see why not. Should be tasty! Oh how I wish I had this recipe last Sunday for Sunday Dinner, this would have been delicious, something different instead of a heavy white cream sauce. Instead of making the pasta I made the shrimp and warmed some corn tortillas …it was lemony delicious! Leigh Anne – I hope you enjoy it! I literally just made this for dinner and it was AMAZING!!! I love your site. I decided to start eating clean about 2 weeks ago and the site has been a godsend. I never learned to cook growing up, so I ate out 90% of the time. Everything I was eating was processed and I felt pretty terrible. I feel great now, so thank you!!! I can’t wait to try more of your recipes! I just made this for dinner. I thought that is was delicious! My son, who is six, informed me as I was making this that he doesn’t like lemons. So, for him it was a bit to lemony. But my two year old daughter enjoyed it. I am trying to gradually introduce clean eating into our eating regiment. Should be easier once we return back to the US (my husband is stationed in Okinawa, Japan). I have enjoyed your site and find it very informative for a newbie! I made this for lunch with shirataki tofu pasta- quick, healthy and tastes great! HIGHLY recommend 🙂 Thanks for sharing! I was a bit worried about it being too lemony, but it was sooo good! Actually, both hubby and the kids (age 4 and under) thought this was FANTASTIC!! This will be our go to scampi from now on. I did let the sauce reduce too much (def remove from heat when finished), but just added more water and it was delish. Thank you so very much!! This was a smash with my family! Getting them to eat better is such a chore, but they loved this! Thank you so much for sharing! Deeeeelish! Just made this for dinner tonight. It is so delicious! And very easy to make for this tired Kindergarten teacher! Can I used regular diced garlic instead of garlic powder? I’m using frozen, but raw shrimp, can I use a bit of broth or stock to make the sauce and keep it clean? Janet – Yes to the garlic, and as for the stock, depends on what’s in it.